We need to understand our Industrial “Why” our Industrial “Purpose“. That strong foundation and belief in something Noble and Honorable. It is from this position that we serve others, sacrifice without counting the cost. When we stumble, we get back up because of our Purpose our Why. All actions and subsequent success stem from this position. GO BIG – Understand Your Purpose/Why! 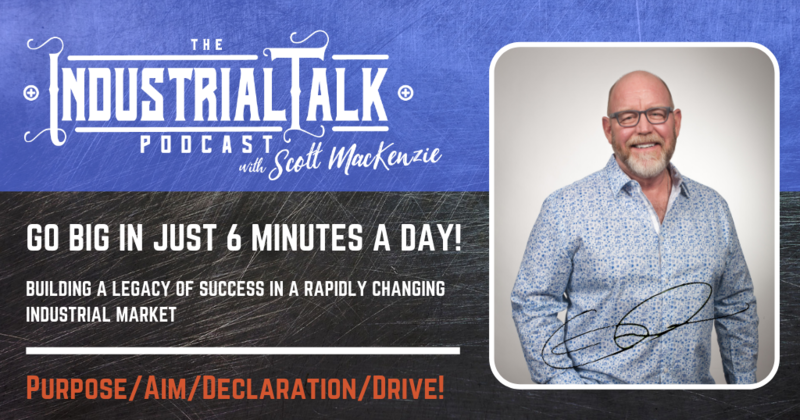 [00:01] The industrial talk podcast GO BIG in just six minutes a day, building a legacy of success in a rapidly changing industrial market either. Welcome to the industrial talk about gas. My name is Scott MacKenzie. I'm so glad that you are here. Let's go big. Let's try to keep it in six minutes. We're it. Be talking about purpose, aim, declaration of drive and the importance of being able to feel that within your soul. So let's get going. [00:29] Yeah. This subject matters really important because I look at it and we've been talking over the past couple of weeks. We talked about no like trust. We've been trying to develop those tools as well as caring and friendship and and we recognize that that model no like trust plus carrying and friendship is vital to success and, and let's just be candid about that, but that stool I look at, those are legs. Got a lot of legs on it, but that's a stool and that still has to fit on something or set on something and that's what I look at from my perspective. My little brain here looks at that and that is the foundation of purpose that that why, what? What is it in you that that will drive you to a constantly getting back up, constantly doing what you need to do and and get knocked down, fail, get back up, do it again, because that, that purpose, whatever's inside of you, that heart is driving you to fulfilling that purpose. [01:28] Now, I'm not an expert. Don't get me wrong, I'm not. Let's just lay that out right there. I had an experience number of years ago and a really good friend of mine by the name of Jim Witt with purpose on limited and I just realized me personally, I had all of the trappings of success, but I really wasn't driven by a purpose and it was a very humbling experience to say the least. So anyway, we're going to talk about purpose and we're going to talk about why. Okay? One of the things that has always amazed me, if you see individuals like, uh, like, like say Mother Teresa, okay. That is a great example of somebody living a purpose, changing the world through her purpose. Now that purpose is to love the unlovable. Now I look at it and I look at her life and I look at other people in that same life and I realized that holy cow, do I have the heart to I have the soul to be able to do something like that, to go into the areas of poverty and be able to live a life of love. [02:41] Now that's a purpose. She changed the world through her purpose to love the unlovable and that's what we're talking about here. You have to understand what your why is and what we've been breaking it down to something that is a little bit more tangible. I was driving to a client and I was doing that over a couple of years and every morning there was a gentleman in this gentleman would be riding a bike and that and and every time I would just sort of watch him ride a bike and then he would get off the bike and then you pick up some trash. He didn't have to write and that's what he did every day. Every day he would ride that bike every day. He would pick up trash in his world. He was contributing to the cleanliness, I would imagine to his community, but he did it every day and I always just fascinated by that example because I know that if I was riding a bike, would I pick that plastic bottle up, but for whatever reason within that gentleman, he had the purpose of saying, I'm going to make an impact. [03:49] It might be small, but I'm going to make an impact, a positive impact. I'm going to keep my community clean. That's purpose. That is a sense of purpose that does. It's like humility there. I'm going to do it just because, well, I have to do it. So it's very important that we talk and you realize and you you strive because we talked about personal education. You strive to understand what your purpose is because all of that equation that know, like trust, plus carrying plus friendship, the success is for not. If you don't understand your why, because without that, that why that noble purpose, that that inner strength that says, okay, I failed. I failed so many times, but if it wasn't for my desire and I'm serious, this is my purpose, to give them 100 percent to you, the listener to be successful, no obligation, that's it. [04:56] One hundred percent to you to be successful, and I'll do whatever is necessary to make that happen with nothing in return. So with that purpose, if I get knocked down, if I have a tough day, if I have something good, I know in my heart of hearts that I've got to get back up because I want you to be a success. I want you to have information that that can help you on a daily basis. That's a purpose, and so without that purpose, I'm not going to get back up. It's like really do I do I need to do this? And for many, and I mean many who struggle out there can really find the root cause of that struggle to the point that they don't have a purpose. That why that stake in the ground that says, Hey, this is what I'm about. This is what I'm gonna do, right? [06:28] going through that struggle is part of finding your purpose. It's important. It's very good. Important contact. It does. Real talk.com. Get Ahold of me. You want to talk purpose, document because I think that from my perspective, that is one of the most important, one of the most important components associated with your success and it's six minutes. That foundation to all that know, like trust plus hearing apprenticeship. He will have success. You need it. So let's have a great day. No complaining because we live in an open flame zone. Complainant, make it a great day, be driven by your why, your purpose, and we will talk to you again tomorrow.